The MGA Twin-Cam was developed by MG in response to a market clamoring for increased power. With the 115 BHP DOHC 1,588 CC engine introduced in 1958, it was capable of 110 mph. In 1985, Naval Officer Francis Ron Neal discovered this Twin-Cam in dry storage in North Carolina. He was then transferred to England and had the car shipped to Twyford in Southern England for restoration by marque expert Peter Wood. The car was superbly restored in its original Old English White and the interior was re-trimmed in the correct materials, including the black leather Competition Deluxe seats. Side curtains, a top boot and tool kit accompany this MGA. 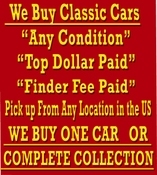 In 1989, Mr. Neal relocated to Charleston, South Carolina, and he campaigned the car at AACA events, garnering awards in 1991 and 1992. Mr. Neal sold the MGAin 1998 to Michael Grosso, who maintained its restoration, driving it rarely. In 2014, Roy Miller, a Pebble Beach Concours dElegance® judge, acquired the MG and then sold it to its current owner, who had the well-known Twin- Cam guru Jim Alcorn at Auto Vintagery in La Jolla, California, fully review and service it. The car is stated to have very limited mileage since the restoration, and to drive as well as it looks. 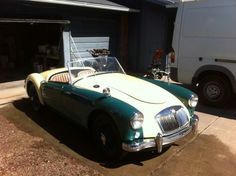 A certain crowd pleaser, this MGA Twin-Cam is sure to delight at shows and on the road.